This article is a great resource for couples that may have some confusion, disagreement or frustration in their relationship. 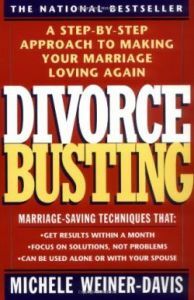 Michele Weiner-Davis is the author of “”Divorce Busting,” a bestselling book on how to get your marriage back on track. She is also a relationship expert and marriage therapist. The article below, discusses an interesting cycle that marriages go through. Read through each stage to see where your relationship fits! Realize that you are not the only one and that there are various resources our there to help you push through your battles and disagreements.